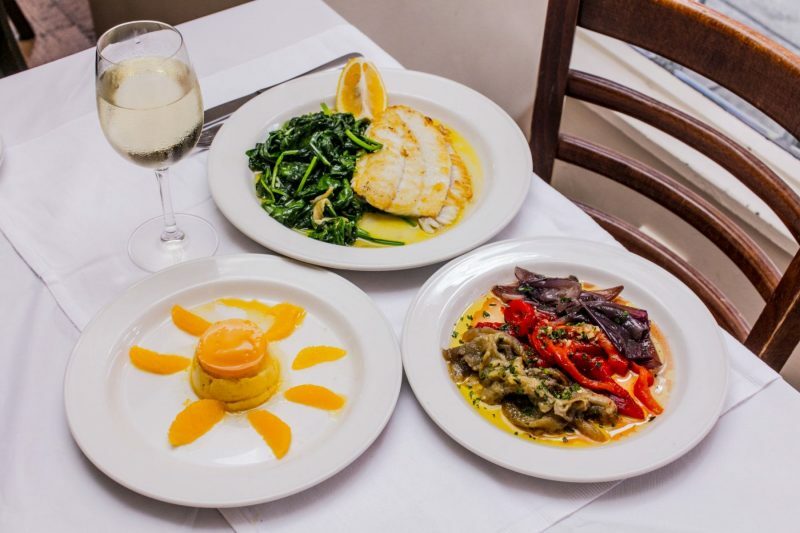 Tucked away in the neighborhood of Bloomsbury you find an unassuming tapas restaurant. Cigala, which opened its doors in 2000, hosts the likes of London dwelling celebs on a regular basis – and I can see why. We were immediately greeted with a cold glass of cava and from the first bite of Manchego cheese and imported jámon, I was transported back to the streets of Spain. Tapas and small plates have always been one of my favorite meals. R ich, decadent ingredients and sharing with others – it’s so communal and inviting. We ordered a bottle of Nivorious Rioja, it was crisp and dry like most Spanish wines and it warmed us up on a chilly and rainy London evening. It’s the type of white wine for red wine drinkers, filling, robust and savory. At the recommendation of the server we ordered five dishes, which was more than enough for two of us. We ordered the calamari, prawns, lamb meatballs, and patatas bravas. The meatballs and prawns are not to be missed! All accompanied with bread made in-house and aioli. The restaurant’s simple and elegant atmosphere emphasizes the quality of the food. Every dish was fresh and basic. The hearty albóndigas de cordero (lamb meatballs) in flavorful tomato sauce and the light gambas al ajillo (prawns) were my two favorite dishes. The prawns were fresh and prepared with garlic, olive oil and parsley. The olive oil is imported from Valencia and made from aubeguina olive. The lamb meatballs were comforting on this particularly cold night. Both paired lovely with the crisp white wine. With each bite you can taste the authentic ingredients, which are imported from Spain, often by the owner. The restaurant is discreet and functional, allowing the incredible ingredients in each dish and carefully selected wine to do the talking, many of which can not be found anywhere else in London. The simple setting allows for intimate dinners but the size of the restaurant can accommodate larger parties. This was certainly not my last visit to Cigala, I have already made a reservation for next time.